The 2018 USATF Half Marathon champion discusses her goals for the year ahead and her long-term aspirations to launch a career in public health. 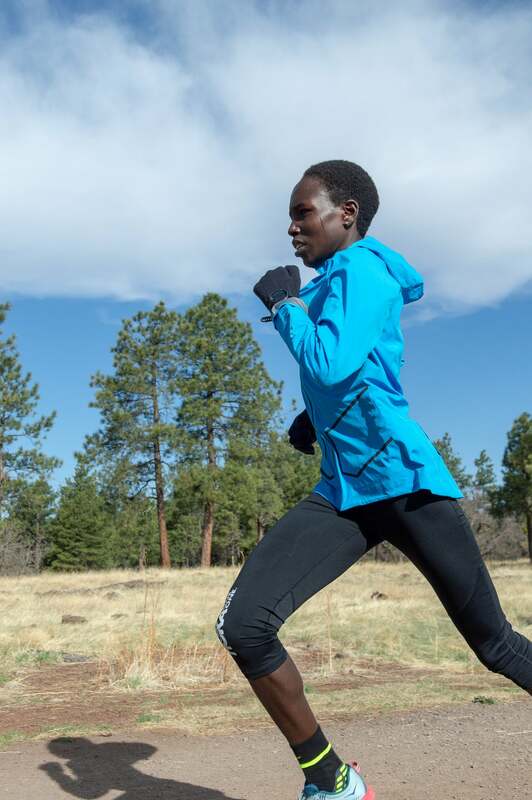 Twenty-nine-year-old Aliphine Tuliamuk has had quite the year. 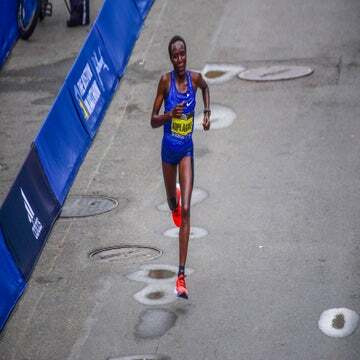 After racing to a first-place finish in the USATF Half Marathon Championships in early May, she continued with a second major victory in the USATF 25K Championships just one week later, quickly establishing her position as a serious contender in the long-distance women’s field. 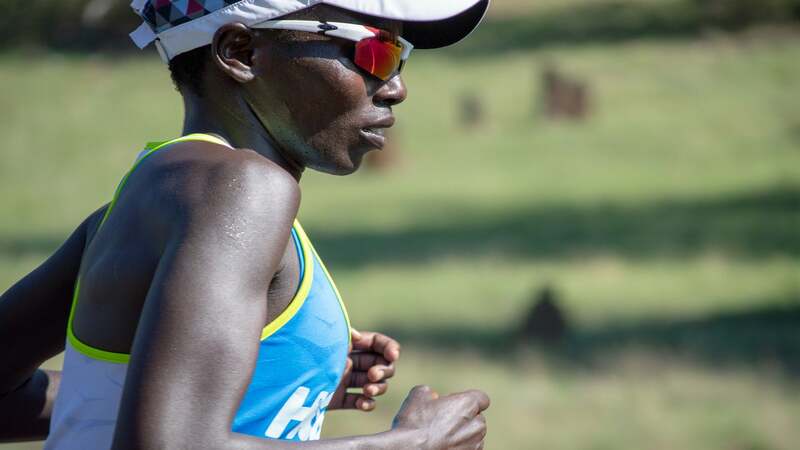 Though Tuliamuk’s goals for the years ahead include finishing her nursing degree to provide her home village of Posoy, Kenya (where she grew up alongside 31 siblings), with free healthcare, first on her agenda is supporting and inspiring her family and friends at home through her running career. Next up: mastering the marathon strategy in 2019. What first made you want to become a runner? It was never something I had planned on doing. I ran when I was going to school as a young kid—we ran to do chores, we ran to do everything. It was a way of getting from point A to point B. Eventually, I started running in school competitions. My teachers noticed I was running really well, and they selected me to represent my school. After you realized you had a skill for running, what factored into your decision to pursue it at the professional level? Once I started representing my school, I worked to the next level and the next level. Instead of being in my local village, I was able to travel to the next school and the next level and eventually I got to the national level. At that point, I’d met people who had represented Kenya, and I knew that they made money by running. I grew up with kind of a poor family—by the standards of where I come from, it’s not really poor. My parents didn’t have jobs, but they were farmers, so the way I grew up is not considered poor. When I think now about how they didn’t have jobs, they didn’t have a source of income, they were kind of poor. But then I met these other athletes who were running, going overseas and making money by representing Kenya. I decided I wanted to pursue that option. What race distance feels most challenging to you at this point in your career? The shorter, the worse. When I was in college, I thought that 5Ks and 10Ks were pretty long, but now as a professional athlete, especially on the road, a 5K seems like a sprint—even a 10K. I don’t have the speed that I used to have. I definitely have the endurance, and I can handle the longer stuff, but I’ve only run two 5Ks since I’ve been out of college. I’ll only do a 5K when I absolutely have to do it. It’s just too short. It feels longer if you’re doing it on the track, but when you’re doing a short race on the road, as soon as you start, your body’s picking up, but then everybody’s sprinting and the finish line is coming. I remember when I did my first 5K; it was with the B.A.A. I remember starting, and I seriously was left at the start line. I was thinking, I’ll catch up with them. Little did I realize that the finish line was coming up so fast. I ran so poorly that day, and my coach kept making fun of me that I didn’t show up at the race. What’s your sweet-spot distance right now? The half marathon at this point is a good distance for me; however, I do think that the marathon is going to be my thing. At this point in my career, I haven’t mastered how to run it. I’m still having trouble, and I have only run three of them. I need more experience with that, but I do feel like the longer, the better. I think the half marathon is definitely something I have mastered. However, I do still have a lot to accomplish at that distance, too. Are you aspiring to race the marathon at the 2020 Summer Olympics in Tokyo? Absolutely. That is a dream of every marathoner. For me, I would love to go to Tokyo and run the marathon—but before that, I want to be able to put myself in a good position to work well with some of the best runners in the world. In 2019, I’d love to run a really fast time in the marathon and get ready for the Olympic Trials. My big goal is to make it to the 2020 Olympics, but along the way, I want to learn how to run the marathon better. I want to become comfortable with the distance. You can’t make the Olympic team unless you know how to run the distance well. Photo of Aliphine Tuliamuk provided by Northern Arizona Elite. What inspired you to study public health in college? It goes back to when I was younger. I grew up in a really small village, and we didn’t have access to healthcare. I remember as a young kid, my mother had two infants that died because we didn’t have access to healthcare. With one of them specifically, I was there, and my mom asked me to run to the nearest health center to check if the doctor was there. I did, and it was closed. I went to these dispensaries, and all of them were closed. My baby brother died before he could get medication; he didn’t even make it to the hospital. My other brother, a few years after that, died because of a lack of access to healthcare. My sister had a baby, and she died. Things like that inspire me to want to get a career in healthcare so that maybe I can go back and help people in that community, in my village. I would love to be able to do that. I studied public health in college because I wanted to be a nurse, but then I realized that I wouldn’t be able to do medical school and run, and of course I wanted to become a professional runner. So I decided to get a degree in public health, and I did all of my nursing prerequisites so that now, if I want to go to nursing school, I just have to do the entrance exam and take one more class. If I have that, and I get a few of my friends, we could go back to my village and volunteer, give people free access to healthcare. That is the motivation for me to want to pursue something in healthcare. What positive changes do you hope to bring to the running community? I want to be able to be a positive role model. Having been to college and having a college degree, that’s a huge motivation. I hope to be a positive role model especially for girls in my community. I’d like to show them that you can get an education and also be a good athlete. In the U.S., when I go to races (organized by New York Road Runners especially; I’m an ambassador for Team for Kids), it’s good to show kids that they can do what they want in terms of being an athlete. I inspire them, I tell them my story, and if someone is going through a hard time, they can know that it doesn’t have to prevent you from getting to your goals. I just want to inspire the next generation of athletes. When you speak with your childhood family and friends, what’s their reaction to the success you’ve had as a professional runner? My family is very proud of me; my dad is really, really proud of me for what I’ve accomplished through running, through coming to the U.S. and being able to help my family. I’ve been able to help pay tuition for my brothers and half-brothers. I have 31 siblings, so I have a huge responsibility to help my family. I’ve been able to do that, and they think it’s incredible that I’ve been able to pitch in and help them through my running. My siblings are trying to follow in my footsteps. I have one brother who’s going to college and running; he’s a student athlete at Liberty [University]. He was never a runner, but when he saw me run, he wanted to do that and is happy he did. I’m so proud of him. Stuff like that makes [me] realize that I’m doing a good thing; you don’t always know if you’re doing the right thing or not. Things like that motivate me to continue to run because I know that my family looks up to me, some girls in my village look up to me; they want to be better, or they want to be like me. I hope they will be better than me. Doing all of this has definitely inspired them. I’m grateful for that. What do you hope to achieve running-wise in 2019? In 2019, I want to do the very little things that will keep me healthy for 2020. I want to run a couple of marathons, maybe even try a fun half marathon and improve my personal best. I would love to represent the U.S. in the [IAAF] World Championships.